While the concept of cooking food right on your tabletop isn't new by any stretch, it does place a certain degree of responsibility on patrons used to having all the cooking done in the back of the house. You can't go into a place like Ejo Korean BBQ (633 E. 3300 South, 801-474-0047) and later complain about it on Yelp—if you didn't like the experience, then you did something wrong. Knowing that, make sure you hit up Ejo with a group of people who are interested in having a good time with their meal—things could go south very quickly with people who regularly imbibe at the font of hater-ade. The space has cleverly merged the Korean traditions of tableside cooking and serving a series of small dishes with the American tradition of the all-you-can-eat buffet ($14.99 for lunch; $24.99 for dinner). It's a combination that works very well and offers diners a breadth of Korean staples to choose from. Each table at Ejo is equipped with a flat-top grill that the staff activates once you've committed to the buffet. From there, you order generous portions of prepared meat that arrive like marbled works of art—it's almost a shame to slap the thinly shaved slices of angus brisket on the grill after they've been arranged like rose petals on a plate. For those who aren't in the market for the DIY experience, Ejo's buffet comes with several pre-cooked options. Their tofu soup with seafood is fantastic, and it's only one of their many tasty soup options. The buffet also comes with a salad bar of sorts—more on that later—which contains more than enough food to make a good meal. Outside of the buffet option, Ejo offers a $9.99 lunch special—here you can get all your favorite Korean meals for a helluva good price. The selection of grill-it-yourself proteins consists primarily of brisket and pork belly, both of which are available unseasoned or prepared with different marinades. The bulgogi, for example, consists of thin slices of brisket marinated in a sweet and savory soy sauce, and the pork belly can be served with a red wine marinade. 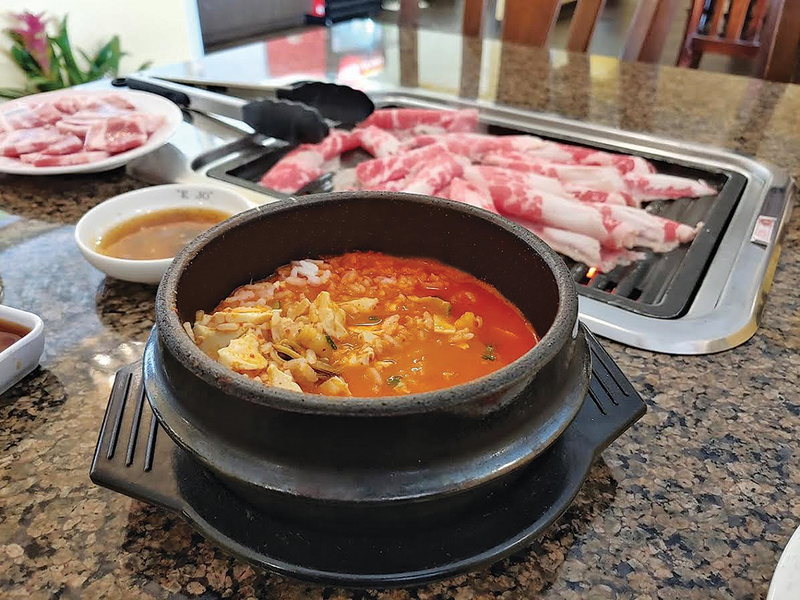 Both options impart their respective flavors to the meat while grilling, but the unseasoned options let diners take full advantage of the salad bar filled with smaller side dishes called banchan. In addition to fried rice and glassy noodled japchae, the buffet salad bar includes different types of kimchi and the vastly underappreciated gamja jorim, cooked potatoes marinated in a sweet soy sauce glaze. It concludes with a raw bar of cabbage, onions and peppers that you can grill alongside your meat for some flavor tweaking. The unexpected star of the salad bar is a condiment called ssamjang, a magical blend of soybean paste, hot pepper paste, garlic, onion, honey and sesame seeds, which became the go-to dipping sauce for everything on my plate. It's primarily savory, almost nutty, but then the hot pepper paste smacks the back of your throat. The flavors come together around a slight sweetness, and I can't think of a food it wouldn't complement. With a full plate of japchae, kimchi and gamja jorim, I awaited my first plates of meat. I went with the unseasoned brisket, the red wine pork belly and the pre-grilled daeji bulgogi, which is pork simmered up in a spicy soy glaze. Anyone who understands the satisfying sizzle when slices of protein first hit a grill or has basked in the warm promise that exists within the heady aromas created while cooking will find solace at Ejo. I found that nibbling on japchae and banchan while carefully grilling brisket and pork belly to perfection created a new level of engagement and interactivity to the whole dining process. It's easy for dining out to become a passive experience—we order, we wait, we eat, we leave—but the Korean barbecue doesn't let that happen. Diners share the cooking process and experiment with all the different flavor combinations at hand together, making Ejo an ideal place to visit with a few friends. It also speaks to why Korean food has been this way forever. This is a cuisine that was made to be shared and enjoyed together, and it's easy to get lost dipping into each plate to try new pairings and daring each other to try something outside our comfort zones. Dining is always more fun sitting around a table with a group and sharing the experience from grill to meal, but eating at a place like Ejo makes that process much more accessible. Worlds collide in all the right ways at Murray's Fav Bistro.